Popular Gift Cards - 20% OFF + FREE SHIPPING! Whether it’s your favorite department store, clothing store, restaurant, or something else, we’re sure to have it. 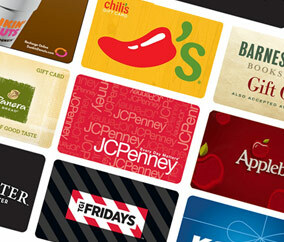 Save 20% on gift cards to over 90 retail outlets and merchants. Share them with family, friends, and coworkers . . . or better yet, splurge on yourself! Click the link to the right to browse our gift card selection. Note to First Time Users: You’ll need to register your account with our Discount Gift Card Center the first time you redeem this benefit. After that, simply use the Username and Password you created.